Taylor Swift’s fans have been speculating for days that Something Was Up. Taylor was posting on Instagram and it was supposedly a countdown from seven – seven days, every day another post with a smaller number, to a major new development. 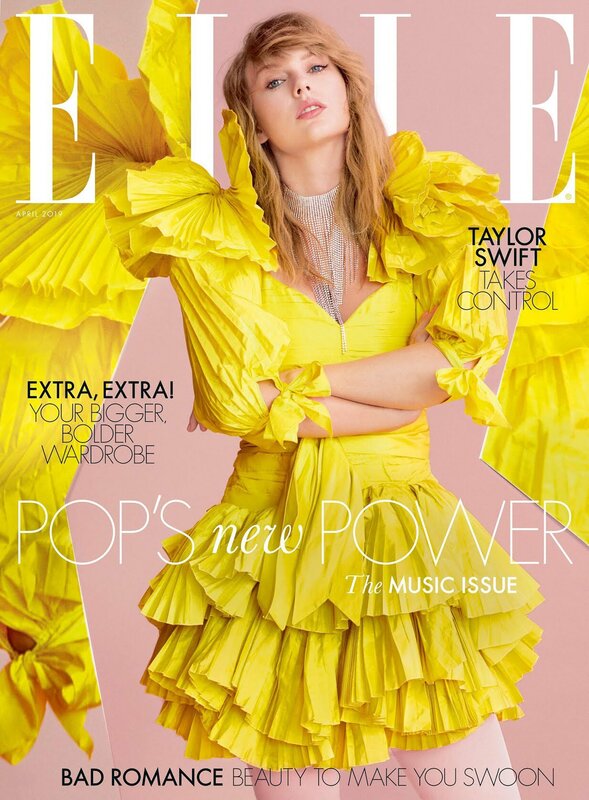 Turns out it wasn’t really an official countdown because nothing happened on the seventh day, although you could still divine something celestial from her eventual reveal last night (which was not the seventh night) – she covers ELLE UK in yellow, with wings, like an angel. Totally by design. This is not an interview. As we’ve seen, Taylor’s taken a lead from Beyoncé: she doesn’t give interviews anymore, but she will write for herself, like Beyoncé, “in her own words”. Taylor’s essay is about music, about what it means to her as a songwriter and as a fan. It’s an unofficial playlist of the songs locked into memory, to which she’s attached joy and heartbreak and feelings in between. But it’s also about pop music and specifically the value of pop music and this is where the work comes in – two albums ago, Taylor Swift pivoted to pop from country, very, very successfully. She’s not new to pop but she’s also not, like, a pop veteran. What she’s trying to become, or declaring herself to be, is Pop’s Avenging Angel. She has a new unprecedented contract with Universal that protects artists’ rights and secures self-ownership of her masters going forward. She was positioned as the artist-advocate for streaming royalties. She is saying in this piece that pop music drives the industry, “breaks through on the most global cultural level”, and is universal and specific in that it represents “connection and comfort”, despite the fact that it’s often labelled “generic”. I’m not sure that the point is argued as effectively as it could be but I can say that her writing is a lot f-cking better than whatever it is that Sean Penn thinks he’s doing – and there’s actually a link here too, because Sean’s most recent literary masterpiece was an Oscars appeal on behalf of A Star is Born, a film about art and artists and that sneers at pop music like it’s an artistic sell-out. Taylor Swift, reigning Pop Angel, is here to tell us that pop should not be disrespected, that Jackson Maine was wrong, goddamn it!, especially since she’s one of the people making pop now. Well…what’s the definition of “now”? Because all her fans were predicting that this magazine appearance meant the next album but there’s nothing here to indicate that she’s readying new music for immediate release. That said, she may be setting a tone to the new era and the identity she’ll assume for it. Taylor Swift 1989 was New York living and friends and fun and squads. Taylor Swift reputation was about the shedding of previous identities and protecting that which remains. Taylor Swift next? Maybe as she approaches a new decade – she turns 30 in December – the shape she’s taking is leadership, or her version of it. Taylor Swift, Pop defender and crusader. Taylor Swift, Pop Angel. If this is what it is, it’s a big ambition. Even a controversial ambition. But a major figure like Taylor Swift isn’t heading into her third decade in the business without a legacy plan. This is what she’s working on now, guaranteed. It’s not just going to be about charting and touring, it’s going to be the active creation of mythology. 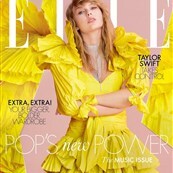 To read Taylor’s full essay for ELLE UK, click here.